Love must be stronger than fear, stronger than fate. The future of two worlds depends on it. Joy Malone has learned to live between two realities, surviving mortal threats and agonizing betrayals. And she's found true love. But the world of the Twixt is in chaos, and the Council wants someone to blame… Facing a danger greater than any she's ever known, Joy must find the strength to rely on herself as her allies fall away, because Joy is no longer sure just who—or what—she is. She knows only that her deepest secret is also her greatest vulnerability and the key to saving them all. As she fights to protect her friends and family and to unite two disparate worlds, Joy has to trust that some bonds are stronger than magic. 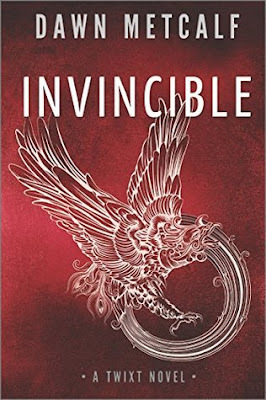 Invincible is the fourth and final installment in author Dawn Metcalf's The Twixt series. Invincible picks up right where Insidious left off. For Joy Malone, the past several months have been a roller coast ride of emotions. Her journey has led to perilous situations, danger at every corner, more enemies than she can shake a stick at, and a romance with one of the Folk that has seen changes in both Joy and Indelible Ink. But, that isn't all. She has stepped up and become a heroine that is more than capable of delivering on her promises thanks to a fickle side of her heritage that has called attention to her being called the Destroyer of Worlds. But, now it is time to get serious. The Royal Majesties of the Folk have been found. Thanks to Joy. They have given her a job to do, "FIND THE LOOP HOLE. Do it soon!" It is only a matter of time before her enemies some visible, and some long thought defeated, find a way to once again make Joy's life a living hell on earth. Joy has an impressive list of enemies. The list includes some of the more powerful villains that she has had the displeasure of meeting over the course of this series. From the Tide who have no respect for humans, to Sol Leander who has had to put Joy's best friend Monica under his protection after she was attacked. Then there's Hasp, Briarhook, LadyBird, and members of The Council who blame her for nearly everything that has happened to this point. Thankfully for Joy, she has a few mentionable allies like her best friend Monica who ended up with the sight thanks to Joy after she was attacked. Graus Claude who has made it is business to train Joy in the world of the Twixt, and Filly, the Valkyrie who is eager to crack some heads open if it means helping Joy survive. Let's also talk about Avery, who is supposed to be working for Sol Leander, but has found himself backing Joy's quest instead. Avery is a key character along with Monica, so I dare not say more other than it's nice to see other characters step up and surprise me as the reader. Metcalf's world is one that features elves, demons, gryphons, fairies, sprites, gargoyles, centaurs & more. Twixt literally means betwixt this world and another. Within this story, is the author's background of what happened that led to the King and Queen disappearing from the world & the creation of the Twixt. It is a world where once upon a time, the folk and humans shared the world, magic, technology & knowledge, medicines, land & children. I do have some curious questions regarding the ending. But, let's be realistic. Were I to add them to this review, I would be spoiling the past two books. I can't do that. As this is the author's first series, it will be interesting to see where she goes from here, and whether she can create yet another wonderfully creative world, with intriguing characters, and storylines.